*This book is in the Rapid Communications in Conflict and Security (RCCS) Series (General Editor: Geoffrey R.H. Burn). The United States is constantly engaged in prolonged armed conflicts with few victory parades. Over the last eighteen years as America mobilized to conduct a series of campaigns against terrorist networks and rogue states, the military achieved tactical victories and limited operational successes but ultimately the U.S. government fell short at the strategic level. After the US-led Coalition withdrew from Iraq in 2011, the nation descended into sectarian violence and ultimately saw major cities fall to extremist groups within two years. Despite a sustained NATO troop presence, the 2016 and 2017 fighting seasons in Afghanistan were some of the most violent for Afghan forces since 2001. The U.S. national security community continues a global hunt for suspected terrorists linked to multiple Al Qaeda affiliates and the so-called “Islamic State” (Daesh). Yet, Daesh’s defeat in Mosul and Raqqa did little to address the local political and economic conditions that created a convergence of interests between disenfranchised Sunnis and global jihadists. Great powers similarly flank America and find creative ways to limit her military power and influence. Russia brought war back to Europe through its audacious activity in Crimea and Eastern Ukraine while using cyber intrusions, as a 21st century form of “Active Measures” (i.e., political warfare and propaganda), to undermine the West’s democratic institutions and mobilize discontent amongst the population. China is outflanking the United States through expansive economic investments in new trade routes such as the One Belt, One Road while combining soft power, new overseas bases and military modernization to balance U.S. conventional power. The character of not just war, but strategic competition appears to be changing. Failing to adapt will result in further losses of blood and treasure as well as prestige and influence. Power withers when it proves frail. This book calls for the rethinking of how the U.S. national security community approaches population-centric warfare and strategic competition in the 21st century. Strategic advantage in the 21st century will emerge from mapping human geography in a connected world, leveraging key relationships, and applying a mix of unconventional and conventional methods that put adversaries on the horns of a dilemma. The authors outline a new approach to thinking about military art rooted in increasing connectivity and defining a new domain of competition, the human domain. In the 21st century, strategic advantage will emerge from how we engage with and understand people and access political, economic, and social networks to achieve a position of relative advantage that complements American military strength. These interactions are not reducible to the physical confines of the land domain, which tend to focus on geography and terrain features. They represent a web of networks that define power and interests in a connected world. The state that bests understands local contexts and builds a network around relationships harnessing local capacity is more likely to win the 21st century struggle for the flanks. In this connected world, even more than before, the decisive battle will occur before the first shot is fired as actors compete to amplify internal divisions and develop key partnerships. Military power exercised through joint combined arms is no longer sufficient to compel adversaries or control populations. Just as conventional forces like those of the United States increased their ability for precision strike and lethal fires, competitors opted to shift strategic competition away from direct confrontations to an indirect clash of wills. The weak undermine the strong through mobilizing local populations - often through predation and manipulating grievances – to carry out insurgent attacks, terrorism, civilian massacres, propaganda campaigns and cyber-attacks. The site of this clash of wills, occurring predominantly in civilian populations and their relational networks as opposed to battlefields of old, reduces the U.S. military’s comparative advantage in combined arms maneuver. As a result, military art is practiced increasingly in a human domain. Military Strategy in the 21st Century makes the case that to be successful in these 21st century struggles, the military profession must recognize and organize for its role in these indirect conflicts and develop appropriate concepts that account for the need to gain a position of advantage in the human domain. Leading military powers like the United States must find a way to maneuver in an interconnected world of competing influence networks. America’s military needs to be part of a global security network optimized for 21st century influence campaigns backed by military force as opposed to fighting 20th century military campaigns loosely backed by information operations. 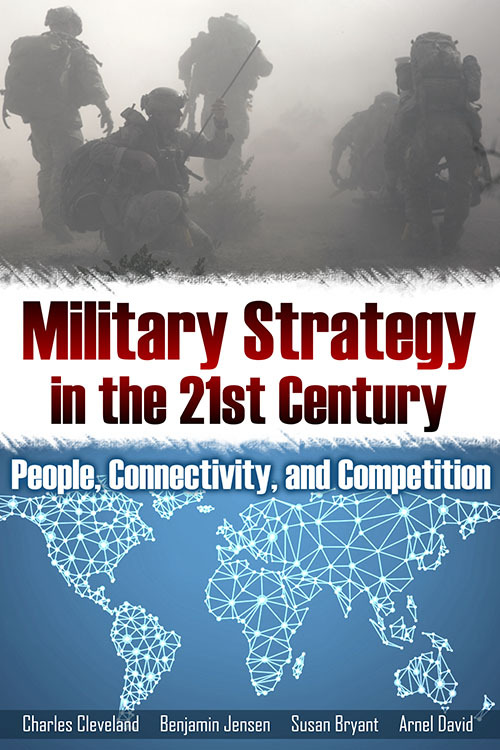 Military Strategy in the 21st Century is an important volume for the military professional, academics who study political violence and security, and general reader interested in the changing character of strategy and conflict. The book would be useful in a range of classroom settings including Professional Military Education (PME), university classes on contemporary military practice and strategy, and graduate classes in security studies and international relations.